Cuba budget holiday. Helping Dreamers Do. Take two weeks to get to know the real Cuba on this exciting and affordable tour. Joining a small group cuts down on costs as well as inviting a shared experience with similar aged and like minded travellers. You don’t know it yet but some of these travelling companions could well become your very best friends for life. Cuba tends to have that affect on folk. It’s in the salty sea air skimming off the Caribbean beaches around Trinidad; it’s in the sway of salsa, the beat of a revolutionary drum. This is not a holiday for tourists seeking all-inclusive resorts; this is Cuba for the adventurers, the travellers, the explorers. 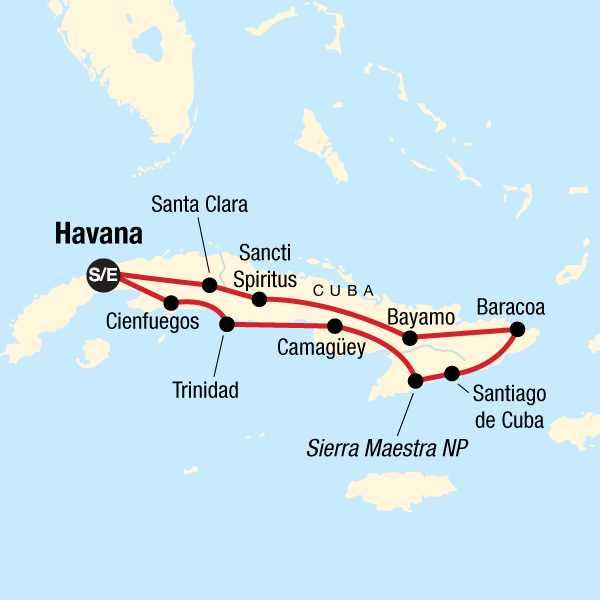 From Havana to Santiago de Cuba by air and onwards overland all the way back to the capital. This is your chance to join the party and soak up the sunshine as well as discovering the island’s colonial, religious and political heritage. Go forth, and free your mind, body and soul. Through our commitment to responsible tourism, we ensure minimal social and environmental impact in the places we visit by travelling in small groups, using local transportation and staying in locally owned hotels. We also work with experienced local guides who are knowledgeable of local culture, history, flora and fauna. On this tour you may have the opportunity to visit a local bike workshop in Old Havana developed by BICYCLES CROSSING BORDERS (BCB), a non-profit organization that promotes cycling by shipping unused and repairable bikes to Cuba. BCB has trained up to 30 Cubans in bicycle repair and maintenance, the majority being women and encourages more Cubans to set up efficient bike shops across the island. We support this project through our non-profit organization, the Planeterra Foundation, developed as a way to give back to the people and places that we visit on our tours. The whole experience was amazing. Cuba is a fantastic place to go and one which is going to change so dramatically in our lifetimes. The atmosphere across the whole island was so warm and vibrant, with live music being heard on every street corner. Check that the tour operator/local agents have checked flight availability from Baracoa and that there are seats for the trip you want to book on. Otherwise, you may have to endure a 6 hour drive back to Sanatiago to catch a flight, when Baracoa's airport is 10mins away. Also check that the flight time won't be 1am in the morning, meaning you miss one night back in Havana and only get to bed at 6am!! That was not a fun day at all!!! The homestays were excellent and really benefited a certain proportion of local people. As did eating in local restaurants who would feed you a feast and whatever was left over would go to the families and friends who do not have access to this food due to their poor currency and rations. Guide – excellent. Itinerary - good as standard, we added more destinations to it, so that made it excellent, as you got a real feel for the island. Homestays – excellent. The country – excellent. The relation between the tour operator and the local agent - very poor. Wandering the cobbled streets of Havana and Trinidad. Jungle walks near Trinidad and Baracoa. Staying with friendly hosts in their own homes. 1. Be flexible and prepared for anything! Cuba can be a very frustrating place, as government control means that things operate in a completely different way to most countries you will have been to. Don't let it get to you - it's all part of the experience! 2. Be prepared for some long days of bus travel from one city to another. 3. Learn as much Spanish as you can before you go - it will really help you communicate with your hosts in the casa particulares. Take some photos of your family / home / pets with you - even if you don't speak much Spanish they will give you something to 'chat' about! 4. Don't expect wonderful food, especially if you're veggie! 5. Choose some of the optional activities that allow you to get out into the countryside. The national parks are beautiful, and make a pleasant change from the hustle and bustle (and yes, hassle) of the cities. 6. Talking of hassle, don't worry about it too much - it isn't nearly as bad as some guidebooks would have you believe. Just use a bit of common sense, as you would anywhere in the world. 9. Should have put this as number 1! Book a few extra days in Havana either before or after the tour - or both! The company will arrange an expensive hotel for you, but I'd book a Casa via the internet - cheaper and nicer. Staying and eating in the casa particulares meant that the money spent on accommodation went straight into the pockets of the local people (although they have to pay a lot of it to the government in taxes!) However my impression was that, in many cases, these families were much better off than most people. It was difficult to find ways of supporting other local people (other than by giving to people who asked for soap / money.) It was a shame an internal flight was necessary, but travelling the length of the island by bus once was enough. I'd consider finding a tour covering shorter distances (e.g., Havana, Vinales and Trinidad) with less bus travel and no need for the internal flight. Learn Spanish - it will really help. I've never wished so much that I knew the language better. Buy a few ordinary pesos, you won't need more than 4 or 5 CUCs worth, in order to buy street food and ice cream, and eat at peso restaurants. Do what the Cubans do - buy a bottle of rum and a few mixers instead of a round of cocktails. It's cheaper. Don't forget that often there is no loo paper and no soap so plan accordingly. Everything is negotiable - taxi fares, goods at market stalls, meal prices at home stays... and don't feel obliged to eat at your home stay. I took pens, soap, note books, plant seeds and sweets with to give away. You'll get asked on the streets for pens and soap. Toothpaste was also a common request! Hard to say really. It benefited the owners of the home stays who obviously had a better standard of living than many of the dwellings we saw. We were happy to buy drinks for, and invite some of the people we met to join us. Nothing that exiting happened on this holiday. You have a relaxing time and you see a few different places on the trip, but if you want to find out about Cuba then this isn't the trip. We gave the locals a lot of tips and stayed in a casa particulares in one place, so the locals directly benefited form us. Friendly people on the tour and you travelled on a private minibus so very comfortable. The places you see are different and you see a couple of different places in this part of Cuba. However you were not given any local information about how the Cubans live, work etc. So if you want to find out about the culture then you don't really want to do this trip. No information at all about the revolution, communism (current, past or future), politics, how the country works, what the Cubans can or cannot do etc. This was very disappointing. But if you want to see a few different places without any hassle of getting around then it is a good trip. Thank you for your comments. We have logged these and will ensure more cultural aspects are included in future tours.